I was looking forward to Amerigo as it's by a designer whom I really enjoy the games of - Mr Stefan Feld. He has great ideas for games and they tend to be tight and really cohesive, although that usually also means his games end up being pretty themeless. 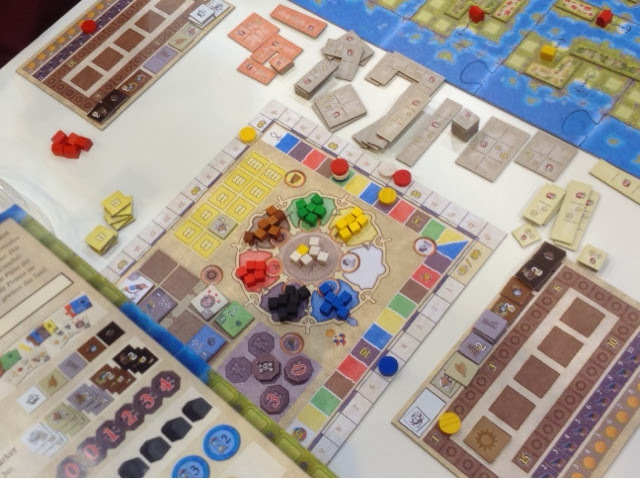 In Amerigo, players are trying to execute a range of actions that involve them exploring, setting up ports, building villages, acquiring resources, and fighting off pirates. There are a total of 7 actions available in the game and through the course of 5 rounds, whoever best employs a mix of these 7 actions will come out the victor. The main feature of the game is the action selection cube tower. In each of the 5 rounds, there are 7 phases where players will drop cubes into the tower. In the 1st phase, blue cubes will go in, and this goes one round as per the picture above with phase 7 ending with white cubes being thrown into the tower. The tower is pre seeded with different colored cubes and so when more cubes go in, some will get stuck, some will flow out naturally, and some with knock previously stuck cubes out into the tray. The color and number of cubes are crucial information for the player. The colors determine the type of actions the players may choose from, whereas the highest number of a single color cube determines how many times the players may execute their chosen action. 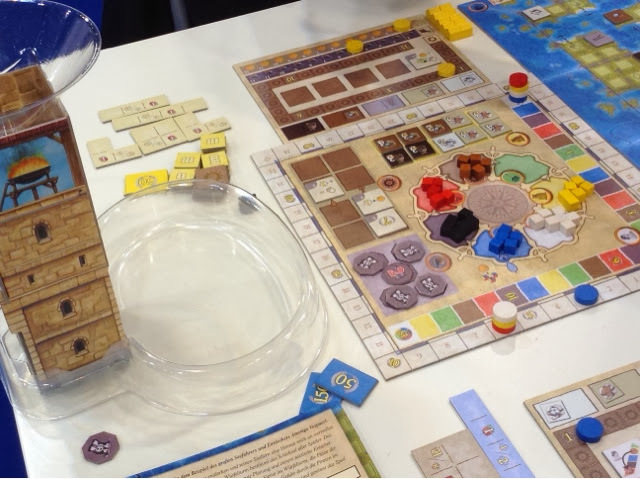 As an example, if there were 4 blue, 2 green and 1 yellow cube that falls into the tray, the players may execute either the explore ( blue ) action, the build ( green ) action, or the resource acquire ( yellow ) action up to 4 times. Because in each phase only one type of color cubes are thrown in, players are able to know that the likelihood of that color appearing is very high, they are only unsure what other colors will tumble out along with the primary phase color. So with these 7 types of actions, players try to maneuver their ships to nearby islands so that they can set up ports and build up villages in the vicinity. 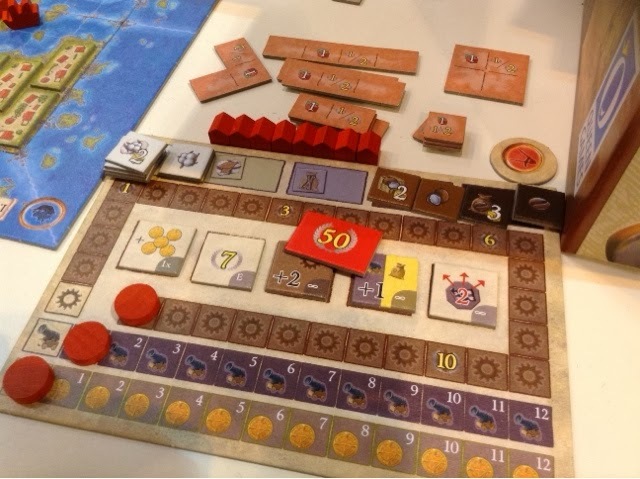 By reaching the port first, they score points, by building village tiles, they also score points. If they completely colonize the island they are on, they will also score more points ( the earlier this is done the more points obtained ). There are opportunities for the players to research and obtain benefits ( ongoing, one time, or end game ). A maximum of 5 benefits may be obtained throughout the game. Lastly, players are also collecting sets of resources for end game point scoring. This is done by buying goods from the market, and also by colonizing certain parts of the island. For our play session, we managed to finish up 4 out of the 5 rounds before giving up our seats to the next eager group ( we still executed the end of game scoring ). Well, I will start by saying that I wasn't too impressed by Amerigo. It was interesting at times, especially in the beginning. This was mainly because the tower was heavily seeded at the beginning. So when the cubes are thrown in, there is a very high chance for multiple color types to fall out so there are multiple action choices for the players. However as the game went on, and the tower got emptier and emptier, the action choices for the players shrunk and gameplay became somewhat straightforward and slightly predictable. There is an in game way to mitigate this and this is found in the turn order track. Wherever you are standing on, there is a color associated with it. And this means that whenever there are white color cubes present in the tray, you may use the white cubes as whatever color you are standing on. So if my marker is on blue, if there are only white and green cubes in the tray, I may choose to explore ( blue ) instead of just moving on the turn order track ( white ) or building villages ( green ). In theory it sounds great but as the game went on, it also became quite predictable when the white cubes will come out, and the answer is - the 7th phase of the round. The above shows 5 whites and 1 yellow coming out on the 7th phase of the round. This will become very common near the end of the game, I can promise you that. That's my one big disappointment in Amerigo. The predictability of the tower nearer the end makes the game very linear and really restricts what you can do. Games should give players options and not fix a path for them. The other issue I have with Amerigo is that it does not feel tight at all. I guess in a way this is partly my fault as I tend to find all of Stefan Feld's games to be tight, so I expected the same from Amerigo. I didn't really feel like I needed or wanted to do everything. I was happy to just sit there and focus on a certain part of the game. This was also partly due to the fact that I couldn't control how many and what types of actions I can execute, so you just went with what the game gave you. I won't say that the game was playing me, but it was definitely telling me not to strategize and to just sit back and wait for things to happen. The cubes do fall both ways as whatever you can't do, your opponents can't do either, but I think this is not the kind of thing I look for in a game. Unless it's quick, simple and silly, any game that needs me to exercise a reasonable amount of brain juices should also afford me the chances and opportunities to choose what actions I want to undertake. 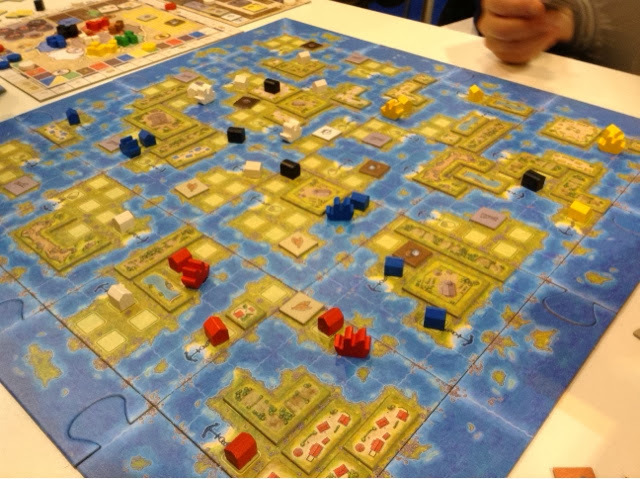 The fact that Amerigo restricted me so much, it really didn't appeal to me as much as I thought it would. 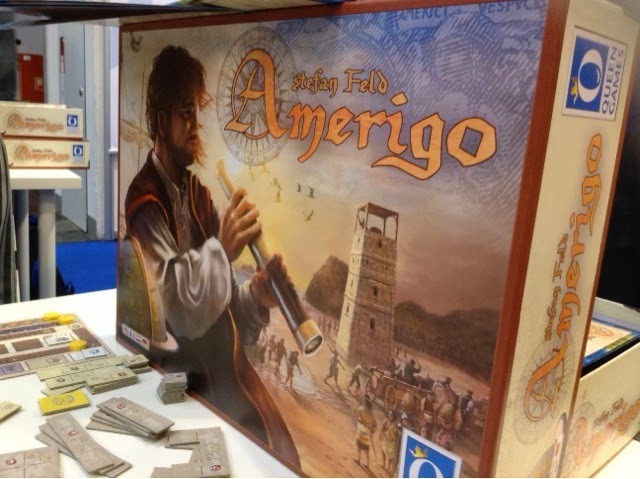 So for me, I think you should give Amerigo a try before you decide if it's for you. And when I mean try, I mean at least 3 ( best is 4 ) rounds. Only with a longer playthrough will you be able to see if you encounter the same problems as I did and whether it will affect you in the same way as it did to me. 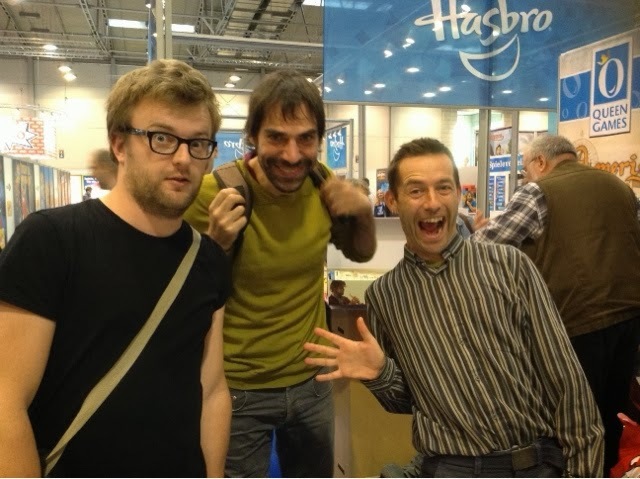 Lastly, just a shout out to the really friendly gentlemen who accepted me with open arms for their learning game. I wish I could have gotten all your names correct but my Dutch wasn't at all proficient in any way shape or form.